National Association for the Blind (NAB) is one of the largest NGOs working in the disability sector, particularly for the visually impaired. NAB delivers a spectrum of services across the life cycle of a visually challenged person, all under one roof. The organization has pioneered a number of welfare activities for the blind, for example, the first ever Talking Book Studio, a modern Braille press and a cyber café for the blind. NAB has a large department for the economic rehabilitation and employment of the visually challenged, whether salaried or self-employed. NAB has served over 72,000 individuals in the past year, and now plans to further extend their specialized services to visually challenged women, children and senior citizens. NAB has received ISO 9001:2000 certification for its Utkarsh Job Development Centre, its technical education programme at the Polytechnic Centre and its Department of Rehabilitation. NAB has also received the National Award for the Welfare of People with Disabilities (2000) and an Excellence in Achievement Award from the Rehabilitation Council of India. Total Income and Cumulative Deficits: The total income raised by NAB in FY13 amounted to Rs81mn, which was about 5% lower than the income in FY12 (Rs85.4mn). Total expenditure in FY13 amounted to Rs89.7mn, which resulted in a deficit of about Rs8.7mn. The Y-o-Y deficits accumulated by NAB amount to Rs55.8mn as on FY13 year-end. The average annual deficit over the past 4 years reviewed is Rs6.5mn. Government: Grants from the government formed 16% of the total income in FY13 (Rs12.6mn). This includes a nominal sum of Rs0.12mn paid as grant-in-aid towards rent of the Polytechnic Centre for vocational training of the blind. Sales: NAB was able to generate 17% of its total income through sales in FY13 (Rs13.9mn). On an average, over the past 4 years, NAB generates 16-17% of total income through the sale of items such as concessional Braille books, watches, slates, etc. to the visually challenged who would otherwise find it difficult to access these aids. Investments and Interest: Investments held by NAB as on FY13 year-end amounted to Rs72.7mn, in the form of fixed deposits, bonds and shares in Government companies. Income generated from investments in FY13 amounted to Rs6.3mn which formed about 8% of total income. Rent Income: NAB also generates income through rent of part of its building property to commercial organisations. A talking ATM has been set up, for which rent is received from a bank, and the basement has been let out to a catering company. NAB received Rs7.6mn by way of rent in FY13, which formed 9% of the total income. 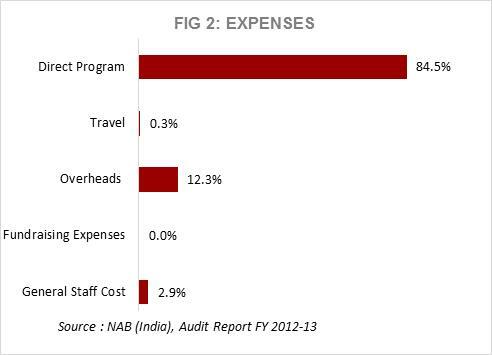 Program vs. Overheads: NAB deployed almost 85% of its expenses in FY13 towards direct program activities, while a little over 12% was spent towards overheads. Fixed Assets: Fixed Assets held by NAB amounted to Rs28.6mn, which included Rs17.5mn in immovable properties (land and building), used as hostels, press and training centres for the beneficiaries and program-related activities. Current Assets and Cash/Bank Balances: Current assets at the end of FY13 amounted to Rs7mn approximately, being mainly advances and deposits (Rs4.5mn) and inventory of sale items (Rs1.5mn). Cash and bank balances stood at Rs8.4mn as on the same date. Corpus and Earmarked Funds: The balance of corpus funds at the end of FY13 amounted to Rs11.5mn, which is around 13% of the total expenditure in the year. Earmarked funds were a sizeable Rs157.7mn at the year-end, and have been set aside mainly for the purposes of purchase of fixed assets as well as for rehabilitation and educational purposes. Current Liabilities: Current liabilities amounted to Rs3.5mn, of which Rs2.5mn pertains to the refundable security deposit from the catering company that leases the basement of the NAB building. Income Growth Rate (IGR): The average IGR of NAB over the years FY11-FY13 comes to around 5.4%. However, FY13 in particular witnessed a drop in the IGR (-5%). Self-Sufficiency Ratio (SSR): The SSR measures an organisation’s ability to raise funds from steady sources of income such as beneficiary fees, investment income, sales, etc. 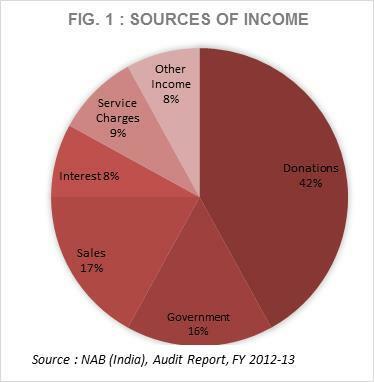 Apart from donations and government support, NAB has an SSR of 41% in FY13 (past four years’ average: 42%). This is a fairly good ratio to have, although for an organization that faces Y-o-Y deficits, it would stand to benefit by increasing this ratio as much as possible. Fundraising: NAB, with its large outreach and wide spectrum of activities, faces the biggest challenge with fundraising. As awareness about the program spreads, the organization is approached by large numbers of visually challenged men and women, seeking help for training and placements. The funding, however, is not increasing in the same proportion as the beneficiaries are, and as a result, NAB faces Y-o-Y deficits that are concerning. Lack of collaboration opportunities: While NAB’s management would have been keen to collaborate with other NGOs and the government to outsource some of the services to its beneficiaries, they found that there is a sheer lack of NGOs of like repute working in the space. They have also experienced poor quality of service through Government programs and are, therefore, not comfortable with depending on them for supporting their students. As a result, NAB is unable to share the burden of its programs with sector partners. NAB is chaired by Ms. Parimala Bhat, who is also a trustee of Snehankit, a helpline for the visually impaired. Also on the Board is K. Ramakrishna, who is recently retired as General Manager at IDBI Bank. He was featured in a book authored by Dr. A. P. J. Abdul Kalam (on forty successful disabled people), and was the first blind person in the world to clear a competitive level management entrance exam. Others on the Board come from backgrounds in business or profession. NAB is registered with Give India and Credibility Alliance.